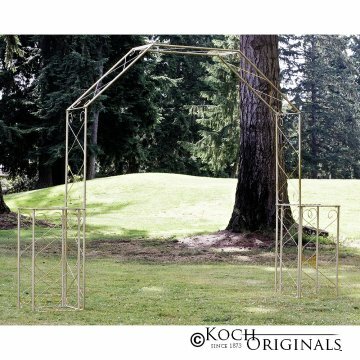 This wedding arch will fit into the smallest area for storage and will assemble in minutes. With it's breakdown design, you can save on transport, storage space and hassle. The WA-80 Wedding Arch includes 12 adjustable non-marring feet for a level and safe setup. It's columns will support a variety of items for decoration. A sturdy, but well designed wedding arch to showcase at all events! Overall size: 130"W x 20"D x 96"H with a walk through width of 86". Shipped in multiple boxes. 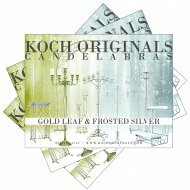 Available in Gold Leaf, Frosted Silver, White or Onyx Bronze (textured black/brown) finishes (choose finish upon checkout). Florals and candles in pictures are not included (available for separate purchase). Note: A special protective coat is applied to all of our wedding arches that preserves the candelabra and keeps it shining and beautiful for years. This hard acrylic finish keeps the candelabra from becoming tarnished. DO NOT use a harsh cleaner because it will destroy the acrylic finish and cause the candelabra to discolor and lose its shine. Wipe off your wedding arch with a dry cloth to get rid of fingerprints and debris.